Clark candy bar. Each Clark bar has a milk chocolate coated outside with a peanut butter crunch inside. You get a chocolate, crunchy and sweet bar all in one. Clark bars are now made by Necco and are now all natural. A great tasting nostalgic candy bar from the 50's. 24 1.75 0z Necco Clark Bars Per Box. 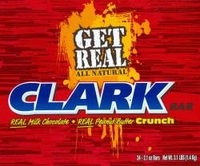 The Clark bar was first introduced in 1917 by the D. L. Clark Company and was called just Clark. The Clark bar first came out as a 5 cent chocolate bar for the soldiers in World War I, this vintage chocolate bar is now manufactured by Necco,it is still as good today as it was yesterday.